Looking for opportunities to give back this holiday season and get some exercise to work off those holiday treats? 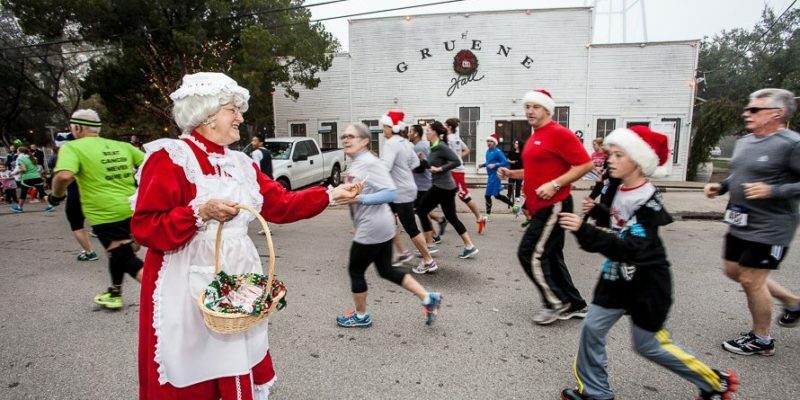 Bring your family and friends to New Braunfels’ annual Jingle Bell Run 2018, Saturday December 8. This fun event is great for all fitness levels with a 5K Run, Walk and Wheelchair events, plus a Kid’s K. The run benefits the SJRC and is presented by Comal ISD and sponsored by the New Braunfels Running Club. Held in the beautiful Gruene Historic District, the race will also have a competitive CHIP time for the 5K run on a certified course. After the race, be sure to stay for the awards presentation with cash prizes for top finishers, have your picture taken with Santa, and enjoy a sausage wrap and a cup of hot chocolate! The 26th Annual Jingle Bell Run New Braunfels also supports a great cause, the SJRC Texas, formerly known as St. Jude’s Ranch for Children. The SJRC cares for children and families who have been affected by trauma, abuse and neglect, providing a safe haven, help and hope to begin the journey of healing. Their mission is to help children to be empowered to grow up to be happy, productive and caring adults. By participating in this event, you are helping to change the lives of these precious children. Life at Veramendi is the start something truly special, a place where family and friends will love to gather, where children will learn and thrive, and where you be a part of the growing New Braunfels, TX and surrounding Hill Country communities. Whatever you’re searching for, you’re sure to find it a Veramendi. Featuring an outstanding location minutes from downtown and high-quality homes constructed with you in mind every step of the way, Veramendi is the ideal community to enjoy the best of New Braunfels, Texas living. Contact us today to schedule a tour and find the ideal builder for your new Veramendi home!